A cura di Matsuya Piece-Goods Store. Introduzione di Fumie Adachi. Illustrazioni in bianco e nero . 8vo pp. 220 Brossura (wrappers) Prime e ultime pagine leggermente fiorite e brunite ai margini (Back cover, first and last pages with light yellowing and browing at edges) Molto Buono (Very Good) This collection presents more than 4,000 individual designs in the 900-year-old tradition of Japanese family crests. Through constant variation and invention over the centuries, this has become one of the richest graphic art traditions in the world. Most of these motifs are circular, and they can all be fitted into a square. Within those limitations is a seemingly endless range of designs, beginning with the dozens and dozens of root motifs ÃÂ€" rice plant, gingko, scallop, lightning, anchor, spool, raft, candle, scissors, fern, saki bottle, lotus blossom, mountain arrow, pine, wisteria, ship, rabbit, and scores of others. Practically every kind of plant, bird, animal, natural phenomenon, and manufactured object of Japanese culture was at one time or another included in a family crest. Questa collezione presenta piÃƒÂ¹ di 4000 disegni individuali ndella tradizione millenaria di stemmi di famiglia giapponesi. Attraverso la costante variazione e l'invenzione nel corso dei secoli, questa ÃƒÂš diventata una delle piÃƒÂ¹ ricche tradizioni di arte grafica del mondo. Molti di questi motivi sono circolari e possono essere inseriti in un quadrato. Entro questi limiti c'ÃƒÂš una gamma infinita di disegni, a partire da dozzine e dozzine di motivi: pianta di riso, gingko, capesante, fulmine, ancora, rocchetto, zattera, candela, forbici, felce, bottiglia di sakÃƒÂš, fiore di loto, freccia di montagna , pino, glicine, navi, conigli e decine di altri. Praticamente ogni tipo di pianta, uccello, animale, fenomeno naturale e oggetto fabbricato della cultura giapponese era in unÃ'Â modo o nell'altro incluso in uno stemma di famiglia. 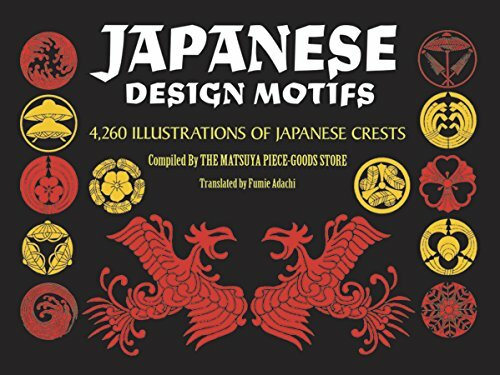 Definitive catalogue of Japanese heraldic crests featuring almost unlimited variety of plant, animal, bird, and geometric forms ― everything from "wild goose" to "folding fan" to "mountain and mist," each with dozens of variations. 4,260 illustrations. "The 4,260 marvelous heraldic emblems...are delicate, interesting, and perfect." ― Lady's Circle Needlework. Most of these motifs are circular, and they can all be fitted into a square. Within those limitations is a seemingly endless range of designs, beginning with the dozens and dozens of root motifs—rice plant, gingko, scallop, lightning, anchor, spool, raft, candle, scissors, fern, saki bottle, lotus blossom, mountain arrow, pine, wisteria, ship, rabbit, and scores of others. Practically every kind of plant, bird, animal, natural phenomenon, and manufactured object of Japanese culture was at one time or another included in a family crest. In addition, each of the root designs was treated to dozens of imaginative variations—they were reproduced bilaterally, in triangles, diamonds, five- and six-pointed stars, in spirals, were built up in series, made to overlap, combined with each other, and so on. Some of these are classic and recognizable designs, like the yin-yang, linked rings, and treasure knot. Many of the others have rarely been seen in the West. Dover unabridged publication of the catalog originally compiled around 1913 by the Matsuya Piece-Goods Store, Tokyo.